Leveraging content for your business is the best way to maximize ROI of your efforts. No matter the size of your business you are working on limited time, personnel, and resources. Trust me, you have time to market, but you just don’t have a chance to do outbound marketing. If you want to compete with the big boys in your market, you are going to have to be smarter than your competition. Every action you take needs to have the sole intent that the results will be bigger than the energy input. This is where inbound marketing and content strategy for your business content comes into play. Inbound marketing allows you to reap more than you sow (in the marketing and business world). The main idea here is to focus on the value your products or services have compared to your competition. Let’s take a look at how you can level the playing field even with limited staff and resources. The first thing you want to do is to build a great marketing campaign to drive your business and generate more income. Here is a step-by-step guide on how to leverage your product benefits. Start with your user persona. What are your customer’s desires and expectations? What problems do they want to solve? What is currently offered in the marketplace? 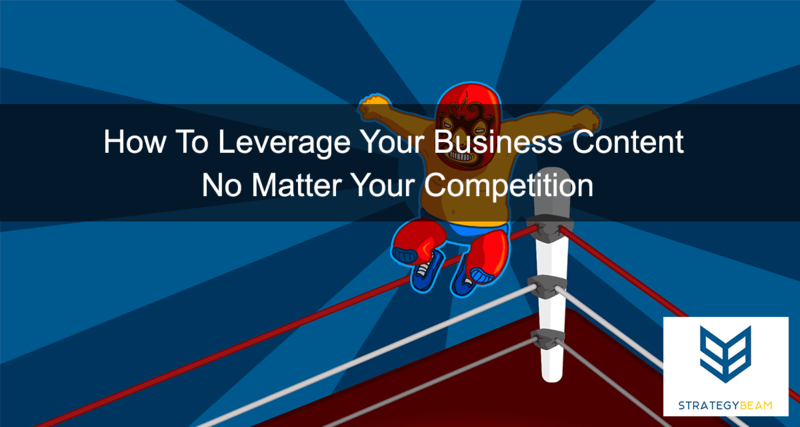 Use the existing solutions to measure your actual competition. Think about how your product, as it exists today, compares to the contest. Does your product stand out in some way that is 10X more beneficial than competing offers? Focus on one aspect or feature of your product or service that you think is 10X better than existing solutions. This can be due to lame product offerings, or need in the marketplace. Once you find an aspect of your product that stands out in the market, validate that assumption with your customers. Build a campaign that focuses on that feature you identified and verified. Use consistent wording across all marketing channels. Use a variety or marketing assets like landing pages, blogging, Call To Actions, etc. to drive traffic to that message. Deliver your message and continue improving your product, so your product stands out in the market. Where they are looking for it. Why they turn to that resource to find that content. The most important part of a strategy is not just about the content or the platform you market on. A significant variable to deliver content is the intent and mind frame your audience is when they are on specific channels like Facebook, Twitter, YouTube, or Pinterest. Now it’s your turn. What strategies have you used to increase customer engagement and improve sales? Let me know if the comments below!